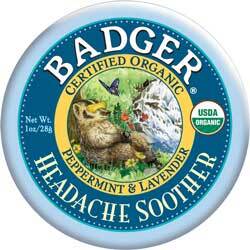 Badger's Headache Soother Balm is absolutely something I cannot live without. 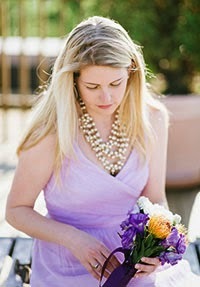 It's perfect for taking the edge off of a mini headache without needing to medicate. It is likewise excellent when the ibuprofen just isn't cutting it. On cloudy, rainy days I pop it in my purse just in case. 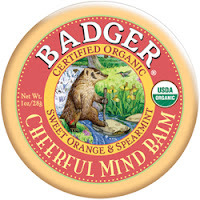 I love my Headache Soother so much that I now have several of the balms in the Badger line and have been thrilled with all I've tried. The Cheerful Mind Balm with it's sweet orange and spearmint essential oils is great when you're feeling a bit sluggish (Monday mornings anyone?) or when you're feeling a little tired and cranky after a long day. 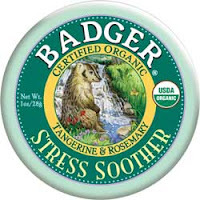 The tangerine and rosemary oils in the Stress Soother Balm is awesome as well - it just melts away while you breathe in the citrusy and earthy aromatics.